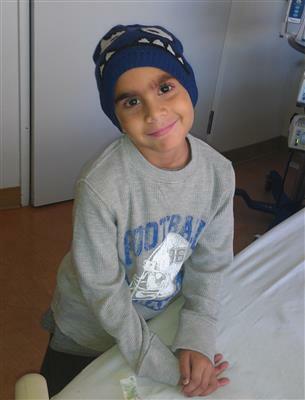 Nolan Naranjo was diagnosed with Severe Aplastic Anemia (bone marrow failure) in September 2011. He was only four years old when he was diagnosed and by the time his fifth birthday arrived, seemingly endless biopsies and blood transfusions had not stopped Nolan’s disease from progressing toward Mylodysplastic Syndrome, an even more threatening diagnosis. A bone marrow transplant was imperative for Nolan, but of 9 million registered bone marrow donors, not one was a complete match for him. Nolan’s doctors determined that he should receive a half match donation from his mother, Jennifer, to be completed on the Bone Marrow Transplant Unit of Texas Children’s Hospital. Nolan had the first anniversary of his transplant in September 2013 and is thriving in every way. He is excelling academically, loves his friends and enjoys taking golf lessons. Nolan and his family continue to express their gratitude for the care they received from HGF, cherishing the organization as part of the team that carried their family through a trying time, supplementing the stellar medical care Nolan received with the critical physical, emotional and financial support their family greatly needed.